The Habitat ReStore depends on donations from local businesses, contractors, manufacturers, and individuals to provide most of its inventory. The profits from the Habitat ReStore help Habitat for Humanity build and repair homes in the community. The Habitat ReStore accepts donations of most items found in home improvement stores. All items must be clean, stain-free, and in good, working condition. 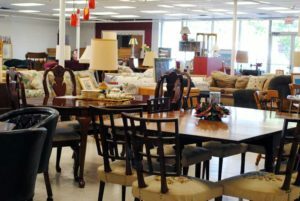 We reserve the right to change our list of donation-worthy items and conditions at any time based on inventory, floor space, and customer demand. 1. If the items fit in your vehicle, you can drop off them at the store, 7612 S. Westnedge Ave., Portage, MI. The drive through donation loop at the rear of the store makes this a quick and easy process. Please do not leave donations when the store is closed. 3. To schedule a pick-up of large items that will not fit in your vehicle, call the Habitat ReStore Donation Hotline at 269-381-5523. All items must be easily accessible on the ground floor and ready for pick-up when our truck arrives. If you would like to make a voluntary, tax-deductible contribution to help offset the cost of operating our truck, our drivers will provide a receipt. For more information on making donations to the Habitat ReStore, please call the Habitat ReStore Donation Hotline at 269-381-5523. Please take a moment to review our Accepted and Unaccepted Items list below. The purpose of this list is to provide a general outline of items we do and do not accept; however, it is not complete. Used dishwashers must be the model year of 2001 or newer. No used deck wood. No nails, no screws, no damage. Used faucets, jetted tubs, factory-molded sinks, shower doors, unframed/beveled mirrors. No electronics, Tube TV’s, computer equipment, CD/DVD players, etc. No used laminate, no used vinyl. No broken, used or partial boxes of tile. No used carpet. No box springs, mattresses, entertainment centers (tube tv depth). No rips, stains, tears or missing pieces as we are unable to perform repairs. No rust. No missing parts. No cans or jars of fasteners. No used garage door openers, gutters, shutters. No new or used siding. No used vertical blinds or shades, no glass shelving, no unframed mirrors, no used window coverings and no wallpaper. No cabinets with water damage, mold or rot. No painted cabinets. No countertops with cracks, holes, cutouts. No used laminate countertops. Items with rot, damage, rust will not be accepted. No propane tanks, no gas or oil containers. No backyard play sets. No used fencing. No used yellow brass light fixtures, no used light bulbs, no track lighting, no used fluorescent fixtures, no fluorescent bulbs and no can lighting. We do not accept paint donations of any kind. No used faucets, water heaters, or water softeners. No broken parts, glued pieces, or rust. No recalled items. No used tools with rust. No table saws, radial arm saws or wooden ladders. No used windows. No single pane windows. No wood screens.